"Woomerang, Boomerang- Look over there! It's Tingha and Tucker, the two little bears!" 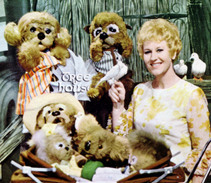 and part of her role involved her introducing ATV's children programming each day. greeting (index finger aligned along the nose, as you bowed your head). of mail it generated completely overwhelmed both ATV and the Post Office. Indeed, its ridiculous success actually hastened its closure! » Tingha comes from an aboriginal word meaning "flat" or "level". It's also the name of a mining town in New South Wales.